Every morning, before heading out to face the waves, Mr French and I go for an 8 kilometer run around the marine lake that is the natural jewel of Hossegor. Just 500 meters from the sea, this salt lake is fed by the sea, with the accompanying tides and a sandy shore. 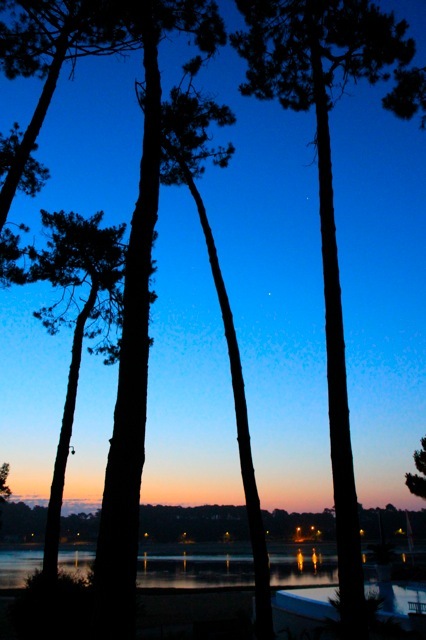 As the sunrises above the lake, the pines form a dramatic silhouette, looking like a Japanese wood block print. 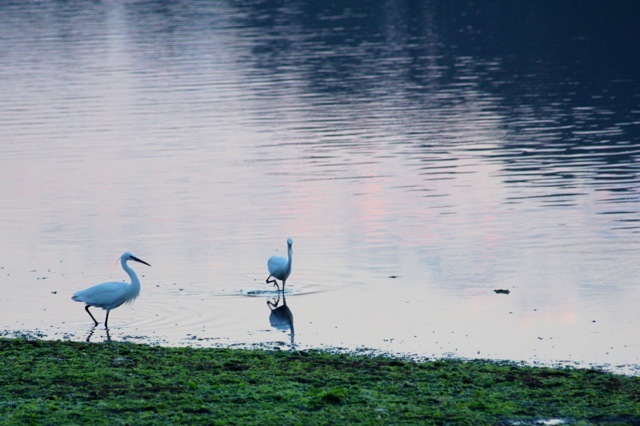 The egret and herons fly in for an early morning snack as the sky turns a dramatic pink. Within a kilometer we are at the Plage Blanche, where there is a day camp for the very young and a fantastic little Breton crêperie where at night, you can dine by candle light, enjoy the perfectly grilled catch of the day, your bare feet digging into the sand. 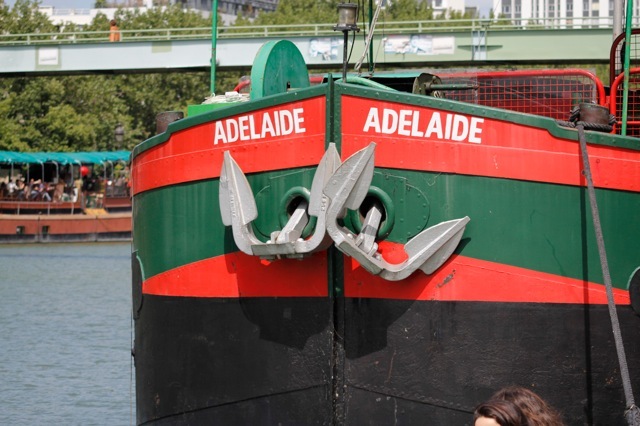 We push on, as fishermen cast their lines, and others run, swim, paddle their wide surf boards, or row their kayaks along the canal that connects the lake to the sea. Over the bridge, and back to the first bridge . passing the bridge that joins centre ville to the beach, we are half way there. Back along the lake, there are catamaran and sail boat rentals and an oyster farm where cormorants guard the pier, drying their wings in the early morning sun. At the tip of the lake the oyster farmers are busy at their “production labs” preparing the days harvest for the hungry diners who will soon be flooding their lakeside stands for cheap oyster (5€ a dozen) and refreshing white wines. At the same spot is La Station. A 1950’s American style gas station that really was a gas station until 3 years ago when it became an very trendy restaurant, serving cheap, but delicious tapas and grilled fish with broccoli to the hipper than hip Hossegordians. 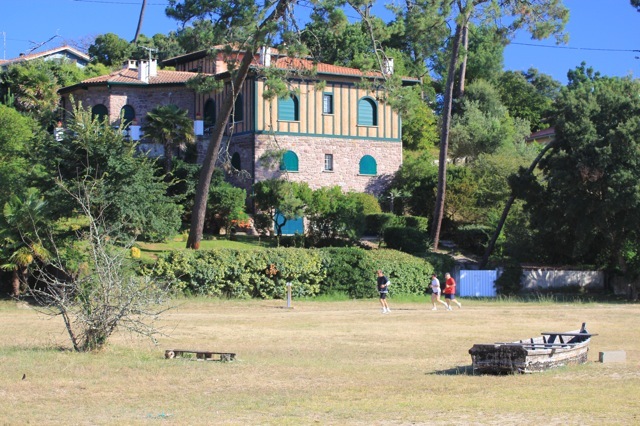 We are now running south, at the foot of stately estates owned by the rich and I-don’t-want-to-be-famous who vacation here, happily avoiding the paparazzi on the Côte d’Azur. I don’t leap into things. 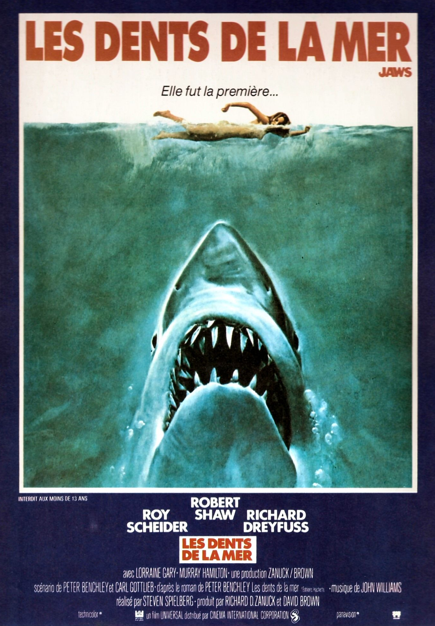 It took me decades of dreaming to get myself and my family to Paris, and it takes me nearly that long before leaping into large bodies of water, many thanks to my fellow Californian Steven and his film Jaws. I need to take my sweet time, wading in slowly; first the toes get wet, then the ankles, shins, mid-calves. You get the idea. Very slowly. As if I was getting swallowed by the boa constrictor in that famous nursery school song. Once I am in, I’m ready to go. Mr French has taught me to boogie board and I LOVE it. First, because it is incredibly fun and exhilarating. As the wave rises you have the anticipation that comes from hoping you’ll be ready to go at exactly the right place at exactly the right moment to catch the ride back to shore. Then, once you’re going, the wave lifts you up and propels you with thrilling speed; you get the feeling that you’re flying without the accompanying fear of falling that one may feel when doing something like hang gliding. Its absolute freedom. I also love the effort it takes to get out to the waves themselves. It is something of a struggle and gives my legs a tremendous work out that feels fantastic. But mostly, I love it because it seems to be the Frenchwoman’s not-so-secret cure for cellulite. They don’t even boogie board, they just stand in the waves and give it a fancy name like Thalasso therapy. It was started by promoters in the 1800’s when the chemin de fer made getting around France easy and Princesse Eugènie was soon addicted. Before promoters knew what was happening, the French were investing a great deal of time and money going to the shore, getting themselves wet at large spas all along the Atlantic coast. I’ve heard rumours that today, certain doctors will even prescribe Thalasso therapy so their patients get it subsidized by the state. This is particularly popular in September, when exhausted grandmothers, who have been chasing after their grandchildren all summer, finally take a break. It is refreshingly relaxing, but works its wonder on fat, as well. After just a few hours in the sea, my cellulite is gone. I don’t know if it is the motion of the waves, the invigoratingly cool water, or a combination of the two, but after a week, I know that my lovely orange peel thighs look will look smooth and sleek for at least a month. So I grab my board and brave the wave, assured that there will be a gain for my pain. Before moving to Paris I’d fantasize about cycling the city’s cobble-paved streets on a traditional Dutch bike, trench coat and middie skirt batting the wind as my red pumps hooked carelessly onto the wide pedals. That was circa 2000. Now the ugly, clunky, but oh-so-practical Velib’s are available with pedals that unabashedly murder a girl’s shoes, yet sensibility has won out and I am often seen struggling along in whatever happens to be the outfit du jour. I still live the dream from time to time, finding it especially rewarding when men turn their heads, and their handle bars, ending in near fatal accidents. But that’s during the week. On weekends Mr French keeps me in check. I get serious about my cycling and we head out on some pretty great adventures. 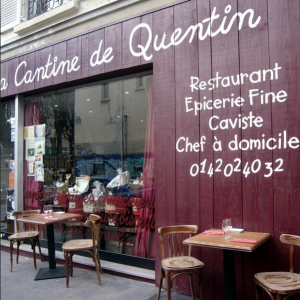 Sunday’s adventure began with lunch on the terrace at La Cantine de Quentin where an ageless, artsy crowd mixes with senile old locals and young families to enjoy tradition French cuisine with an original twist, like the steak tartare served with finely minces mushrooms instead of fries. Or the lentil salad with a foie gras chantilly. Delicious. 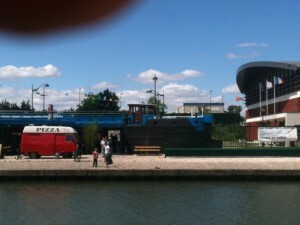 a pizza truck outside the Fishing Cat ballroom - I've kept the finger in the frame, it's so vintage! I know that doesn’t sound like serious cycling, but a girl’s got to eat (and maybe enjoy a glass of rosé). 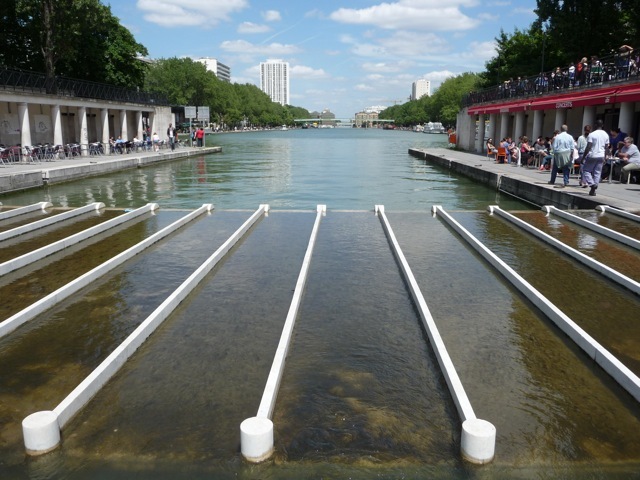 Soon enough we were off, heading north up the Canal St Martin to the Canal de l’Ourcq, with its 25 km of reserved cycling path beginning within the city of Paris, running along the Canal, through the lively La Vilette area with its museums, parks and astounding mirrored geodesic dome. At the city outskirts the scenery starts getting very industrial, very quickly, with cement plants and train yards and fantastically graffiti-ed abandoned warehouses. 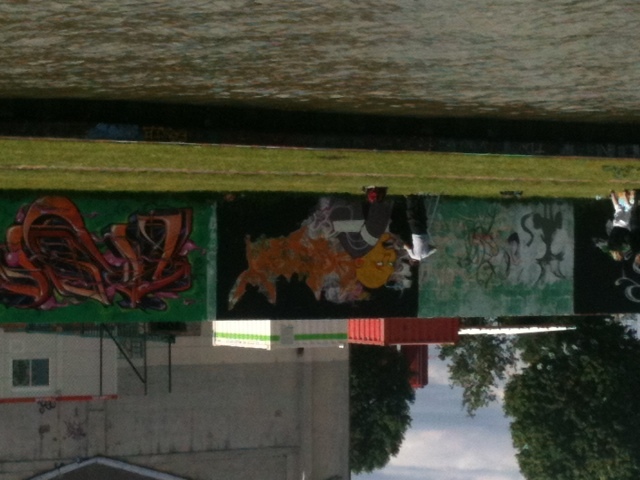 At one point, among lawn and poplars, a group of very talented taggers was hard at work tagged as they partied to rap music and bbq-ed a picnic to share with another group of fans; severly disabled adults with their caretakers and souped up wheelchairs. 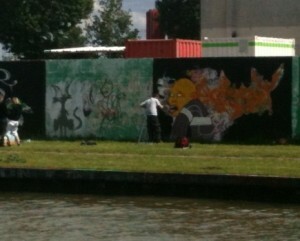 Turns out these taggers have been tagged by the city of Bobigny and they were being sponsored to beautify the area. They were doing were doing an astounding job and were remarkably cool to visit with. The canal was alive: barges went past, Canauxrama boats sped by and trains clamoured along – everyone was on the move. There was a mini-shanty town, temporary espresso bar, the Chat Qui Peche guinguette, kayaks on loan, and many, many other sportsmen cycling, running, or blading along. 16km later we came to the Parc de Sevrans and its gunpowder museum. Yes, Virginia, there is a gunpowder museum. There is also a teaching farm, apiculture center and a climbing wall, but we were pretty tired by now, so it was time to head back, pedaling directly into the wind the entire 16km to La Villette, before heading home. I can’t say we minded that it was the final match of the Euro Cup Sunday night, providing us with the perfect excuse to sit at home, acting like couch patates. Two happily exhausted souls.